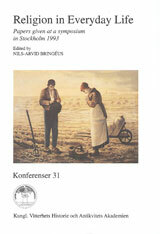 This volume contains 15 lectures about “Religion in Everyday Life, Past and Present” from a symposium sponsored by the Royal Academy of Letters, History and Antiquities and the Foundation Natur och Kultur, Publishers, and held in Stockholm in September 1993. The focus is on religion in ordinary everyday life as reflected in belief, norms and behaviour. A variety of empiricai material from different parts of Europe sheds light on questions of principles such as popular religious visions, the revival of shamanism, the return of the angels, the difference in prayers between learned doctrine and living practice, the role of religious objects and the uses of sacramentals in everyday life, the sacred and the profane in religious festivities.